With its introduction to the world in 1995, online gambling has brought entertainment to gambling fanatics all over the world. Customers can now enjoy the games that they love in the privacy and comfort of their own living room, and all they need is a computer and a high-speed internet connection to enjoy this favored pastime. Gambling has always been a part of human history. It is mentioned in religious books such as the Bible and the Koran; which discuss gambling in ancient times. Since its comeback in the 1920’s after being banned in the 1890’s, gambling has spread globally. With its constant expansion and modern advances in technology it was only a matter of time before gambling would be available online. In order for a game to be considered gambling, three elements must be present: consideration, chance, and prize. Online casino and gaming sites provide all three of these elements on their sites in various innovative games. Most sites offer game categories like slot machines, table games, specials, progressives, and video poker. Each category has subcategories full of a variety of up-to-date games to choose from. For most sites, gambling is as easy as opening an account, depositing funds, and picking a game. Winnings can be withdrawn, in most cases, as soon as the next business day. The software is the same as the software customers see in live casinos. Random number generators determine which hands will be the winners and which will be the losers. While gambling online, there are no dealers and no other players sitting next to you. While this can seem a little less entertaining for some, it tends to make the game go much faster and smoother because players are not talking amongst themselves or with the dealer, or participating in other distractions. This also allows for less error. Because the online games are computerized, it makes cheating much more difficult. Most gambling sites use third party software programmers and random number generators to ensure fair game-play. Established in 1993, Technical Systems Testing, or TST is an internationally recognized testing facility. They provide services for both internet gaming and land-based gaming markets. They provide compliance testing, quality assurance, and transfers of approval to ensure that games are fun and fair for everyone who plays. In order to bring in new customers and keep the old ones coming back, gambling sites offer different incentives and promotions for loyalty. Some offer daily, weekly or monthly drawings and others offer point systems. 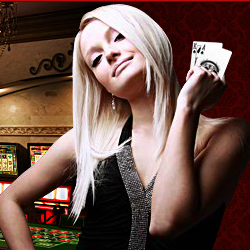 Matching deposits is also another way some gambling sites keep new customers coming in. Promotions can be ongoing or one-time only during sign-up. Most gambling sites ensure the safety and security of customer information by using sophisticated encryption methods. Often-times customers can find the security policies by clicking the security tab which is usually located at the very top or very bottom of the page. Registration typically consists of filling out basic information, verification of ID, proof of residence, and verification of accounts being used on the site. Most sites require a minimum deposit per transaction. The internet has offered convenience in nearly every category of life to anyone with a computer and a connection. Whether a person is shopping for groceries or talking with friends on a social network, the internet makes it easy and more accessible, and online gambling is no exception to this rule. With the click of a button one can eliminate the unnecessary need for casino hopping by staying at home, or playing at one of the mobile casinos on a phone. Customers no long need to find that babysitter at the last minute on a Friday night to enjoy their favorite pastime. The elderly and disabled can now enjoy a Vegas-like experience in the comfort of their favorite chair. No more rushing to Wednesday Night Bingo early to get a seat. Scratch ticket fans no longer have to clean up all of those pesky crumbs when they are done playing, and they no long have to worry about those black stains on their fingers. Gamblers no longer have to stop playing at closing time. Most of these sites are accessible 24 hours a day, seven days a week to anyone with a high-speed internet connection and a computer. Reserve signs on those favorite machines are a thing of the past with online gambling’s no-wait policy. Internet gambling is a fairly regulated industry in North America. In fact, the first North American based online gambling site was just recently launched this year and it is only approved for the use of customers living in British Columbia. Many major credit card companies will not allow for credit to be used on online gambling sites, although, there are ways to work around these limitations. The purpose of online gambling is to combine the fun and excitement of casinos with the convenience of the internet. However, for some people, gambling can be a serious addiction, and adding the convenience of accessibility at home can make this addiction problem become worse. Several sites out there are willing to help regulate how much customers spend. Some are even willing to ban customers from using their accounts per the customer’s request. Many sites also post recommendations for customers. Should gambling become a problem for a customer, many online gaming sites offer information on programs that help with the customer’s addiction, such as Gamblers’ Anonymous. Like with other addictive disorders, with the right help, gambling addictions can be cured.